Mariela Olivares has been a RCSC member since 2005 and decided to compete in bikini bodybuilding in 2016, at 40 years old. A full-time law professor and single mother to two daughters (who spent lots of time at the RCSC daycare), Mariela loves training as a stress relief and for the mental and physical challenges it provides. 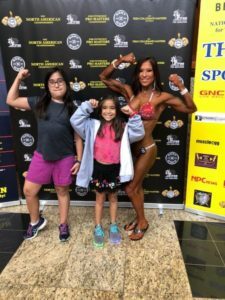 Nationally qualified in each of her competitive seasons, she placed in the 2016 and 2017 competitions and started her 2018 season with two wins at the NPC Maryland State Championship and East Coast Classic. She followed up with a strong finish at the national level competition, Masters Nationals in Pittsburgh! She plans to move onward and upward in the rankings! Mariela trains seven days a week, with five-six days of weightlifting. She is part of a bodybuilding team and coached by professional bodybuilder, Jami DeBernard, but trains on her own at RCSC. “[I am] very grateful to the wonderful RCSC staff and community for the support, excellent upkeep of the facilities and fantastic equipment,” Mariela says. We see many big wins in future competitions! Congrats Mariela!